The Northern Gateway project has received significant support following major consultation as the first phase of delivery is revealed. 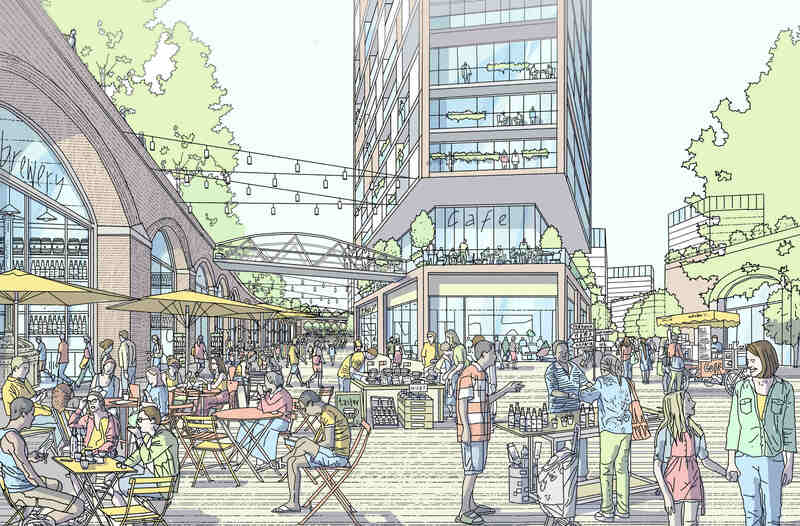 The vision for the Northern Gateway, as set out in the draft Strategic Regeneration Framework (SRF), has been widely endorsed by Manchester people and local businesses to deliver a unique and high quality residential-led regeneration scheme. The Northern Gateway will deliver 15,000 new homes over the next 15-20 years, including 20% affordable homes. Seven new and emerging neighbourhoods will characterise the project, each distinct to the next through considered urban design and place making. The new homes will include a range of housing types and tenures that fit the needs of both existing and future residents. Nearly 80% of respondents agreed with the aim to link these neighbourhoods through a network of high quality parks and green spaces, capitalising on the River Irk and Irk Valley as the green heart of the area and increase bio-diversity. Most respondents believe the delivery of high quality public spaces, and their long-term management, will play a pivotal role in the regeneration project. The Northern Gateway will provide the opportunity to improve the way people travel to and around the area with better public transport, as well as investment in walking and cycling route. Most responses agreed with proposals to improve the pedestrian experience and local amenities on Rochdale Road, which is a main transport route into and out of Manchester. Plans for better social and community investment were welcomed to increase local employment opportunities, alongside investing in facilities for community use. 78% of respondents agreed that the proposed development of the Northern Gateway fully supports Manchester’s carbon emissions reduction plan. The first phase of the project will focus on Collyhurst to the north and Redbank and New Town to the south of the regeneration area. Collyhurst could see up to 530 new mixed tenure homes, including 130 council homes at social rent. Existing residents will have priority over new housing should they wish to remain in the area to help preserve the existing community – a key objective of the regeneration project. The development principles of the Northern Gateway will ensure homes built for sale will be as accessible as possible to all potential buyers. Red Bank and New Town will support the northern expansion of the city centre with the first of the new neighbourhoods of the Northern Gateway, delivering a mixed use, sustainable and attractive neighbourhood, and a statement of intent for the other emerging communities. The consultation responses highlighted the importance of protecting the heritage architecture of the Northern Gateway, and build on the existing historical character of the area. Particularly important to the Red Bank neighourbood, the proposals will celebrate the original railway arches as key to the character of the area. Detailed planning for the Northern Gateway will start this year and physical development could begin later this year. The Northern Gateway project is a joint venture project between Manchester City Council and the Far East Consortium (FEC) - the largest and most ambitious regeneration project in the UK. Cllr Suzanne Richards, Manchester City Council’s executive member for housing and regeneration, said: “I’m really pleased that so many local residents took the opportunity to engage with this consultation in a meaningful way, helping shape the future of their area and the principles for the Northern Gateway. Tom Fenton, project director at FEC, said: “This feedback from this public consultation marks another important milestone in the evolution of the project and takes us a step closer to be able to deliver much needed housing for Manchester close to the city centre. A draft Strategic Regeneration Framework (SRF) was agreed in principle last year, which was the basis for comment during the eight week consultation with a wide ranges of residents, local businesses and other stakeholders.